I am so excited right now – I don’t know if it is from the mug of coffee I just finished or because I have found so many amazing recipes for Thanksgiving that I just can’t wait to share! Every year my parents host Thanksgiving. About 8 years ago I asked if I could help cook. This was around the same time I became very interested in nutrition, so my ulterior motive was to turn our traditional WI thanksgiving into a more wholesome, healthful, and nutritious meal. Thankfully that first successful year has turned into tradition of homemade pies, fresh vegetables, and made-from-scratch cranberry sauce. Each year I search for new recipes to try. In the last few weeks I have found dozens of fall dishes that I can’t wait to try (but will likely have to with this thing called medical school in my way). Here are some of the favorites I have found so far. As I make them, I will post the recipes with notes about how they were. Use a 5-6 quart slow cooker. Peel and chunk the sweet potato and add to the pot. Add diced onion. Follow with the red bell pepper, can of tomatoes, the beans, garlic, and seasonings. Pour in OJ and water. Cover and cook on low for 6-8 hours, or until the onion is translucent and the sweet potato is fork-tender (if you want the sweet potato to get really squishy and disappear when stirred, cook longer). Spray a 4qt crock pot with cooking spray. Peel and slice the sweet potato and stagger-stack in your crockpot. Cover with the 3/4 cup of brown sugar. Open the can of cranberry jelly and squish it out all over the top of the sugar and potatoes. Mix the 1 tsp of vanilla with the cup of milk, and pour over the entire top. Slice the butter, and dot it on top. Crumble the pretzels and mix them with the chopped pecans. Sprinkle over the top. Cover and cook on low for 5-6. This is done when the sweet potatoes have reached desired tendency. Unplug and uncover. Let sit for 15 minutes before cutting into. Use a 6-quart or larger slow cooker. Put the chicken into the bottom of your cooker; frozen is okay, but cut it into chunks. Add the diced onion, canned beans, tomatoes, chiles, corn, and grated sweet potato. Now add the mustard, honey, and dried spices. Carefully stir well to distribute spices the best you can. Pour in the chicken broth. Cover and cook on low for 8 to 10 hours, or until chicken easily shreds with two large forks. Stir very well and serve in a large bowl with your favorite chili toppings. Here is another recipes from The Kitchen Sink Recipes blog. I made this back in the dead of a Wisconsin winter when there was a few inches of snow on the ground and the wind was bitter cold. I substituted spinach for the kale in the original recipe because there was no kale at the local grocery store we went to. Jason loves soup in the winter and this is hands-down, Jason’s favorite. The spice from the sausage penetrates the soup and is calmed by the sweetness of the sweet potato. Heat oil in a large Dutch oven or pot over medium-high heat. Add onion; sauté 5 minutes. Add 1/2 teaspoon salt, pepper, and garlic; sauté 1 minute. Remove casings from sausage; add sausage to pan. Cook 5 minutes or until sausage is lightly browned, stirring to crumble. Add potato, 5 cups water, and broth; bring to a boil. Reduce heat, and simmer 8 minutes. Gradually add kale; cook 10 minutes or until tender. Stir in remaining 1/2 teaspoon salt (to taste) and beans; cook 5 minutes or until thoroughly heated. I realized I had a long list of recipes in my “Recipes to Blog” folder that were naked. That is, I had no picture to show off their deliciousness. I contemplated keeping them there until I cook them, but have decided to post them anyway. There are about 6, so this week one will pop up everyday. As I have said in the past, if anyone cooks any of these recipes, fell free to send me the picture and I would love to post it and your information. This recipe is from 101cookbooks. I never have all of the ingredients that Heidi has on-hand, so I usually have to alter the recipes from their perfection. Luckily, it has tended to work out for me in the past (Spinach-Rice Gratin was a real hit!) and this recipe is no different. The original can be found here. I am sure her’s is delicious as well, so try this one, that one, or both! 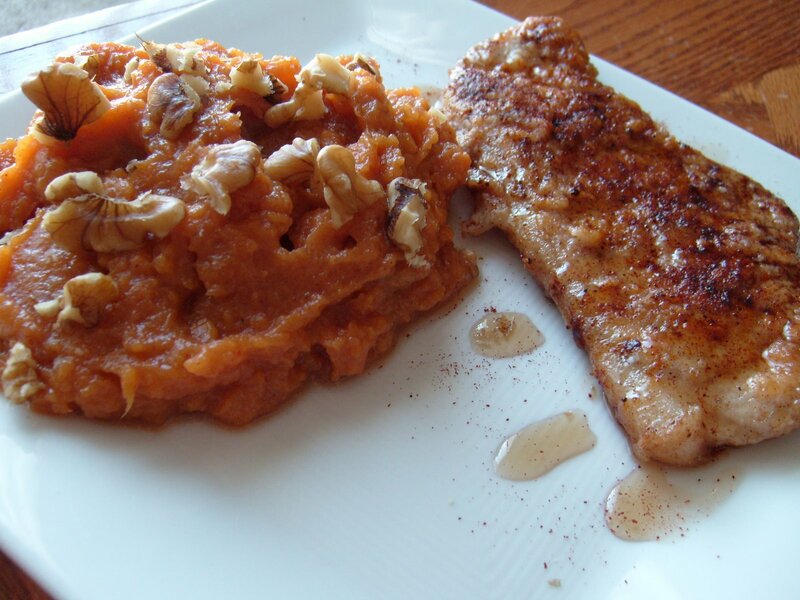 Toss the sweet potatoes, onion, and slivered almonds in olive oil along with a couple pinches of salt. Spray a baking sheet with non-stick spray and pour vegetable mixture onto the baking sheet. Roast for about 45 minutes, stirring every 10-15 minutes, or until the vegetables are brown and caramelized. When the mixture is done, place the rice and the mixture in a large, heated skillet. Add the remaining ingredients and saute for 5 minutes until well mixed. Yes, these pork chops are breaded. Many of you may say, “Lynn, I thought that breading was ‘bad’ for our health!” I would like to inform you all that breading is not “bad” for your health, nor is any other food…everything can fit in moderation. This breading is half whole wheat flour and half all-purpose flour. Breading that is made at home is MUCH healthier than breading at a restaurant and this breading is not deep friend in a vat of oil; just cooked in tbsp of olive oil for the entire batch. If you have questions about this moderation concept, I would love to answer them 🙂 Otherwise, go ahead and try this tasty meal! Bring a large pot of water to a boil. Add the sweet potatoes, reduce heat to about 8 and cover. Boiling them with the cover on will prevent heat from escaping, but be sure to keep an eye on it so it doesn’t boil over. Boil for 20-25 minutes, or until potatoes are tender. Whisk the water and egg together in a small bowl. In a bowl large enough for a pork chop to easily fit in, mix the flours, 1 tsp cinnamon, ½ tsp nutmeg, 1 tsp chili powder, and a dash of salt and pepper. Dip each pork chop into the egg-water mixture and then into the flour mixture. Flip the pork chop to fully coat with flour and set aside. Repeat with the remaining pork chops. Heat 1 tbsp oil over medium-high heat. Add three pork chops and cook about 2 minutes per side. If checking the temperature, the pork is ready at 155°F. Otherwise, cut into the pork chop and make sure there is no pink flesh visible. Thin pork chops could be ready in 4 minutes total. On the last flip, sprinkle the chops with cinnamon and chili powder. Once all of the pork chops are finished set them in a container and put them in the microwave to stay warm. Once the potatoes are done, remove them from the water and put them in a bowl. Mash the potatoes with a metal masher. Whisk in the milk and maple syrup. Add cinnamon and chili powder to taste.